Environmental rooms by Harris Environmental are designed to control temperature and humidity levels at very close tolerance control levels based on the requirements of each specific application. 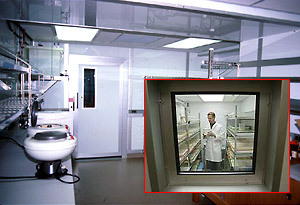 Many Harris environmental rooms are utilized for medical and biopharmaceutical research and development, with other applications requiring close tolerance control for human performance test labs, film testing and development, materials testing, and stability testing. Harris designs these rooms based on the fundamental guideline that no compromises concerning room temperature gradient, microprocessor controls, refrigeration system quality, and humidity control devices can be allowed past our doors. The information that follows will indicate the quality levels we put into every cold room, warm room, freezer, stability chamber, or cold/clean room to provide you with reliable, trouble-free environmental rooms. The Harris Guide To Environmental Room Design – This will teach anyone the differences between a commercial cooler and a true environmental room.